This paper undertakes an empirical analysis with the aim of improving the current understanding of the relationship between labor productivity and urban agglomeration economies across a sample of urbanized areas in the US. Agglomeration economies are represented with driving time measures of employment accessibility to establish a direct account for the link between transport and agglomeration economies. The paper investigates the presence of nonlinearities in the relationship between labor productivity and agglomeration economies, and examines the spatial decay pattern of the effects arising from this relationship. The findings indicate that there is considerable nonlinearity in the relation between productivity and transport induced agglomeration effects, implying that the estimation of country-level aggregate elasticities is likely to misrepresent the actual magnitude of any productivity gains from urban agglomeration. The results also suggest that the magnitude of the productivity-agglomeration effects decays very rapidly with time and is very strong within 20 minutes driving time. 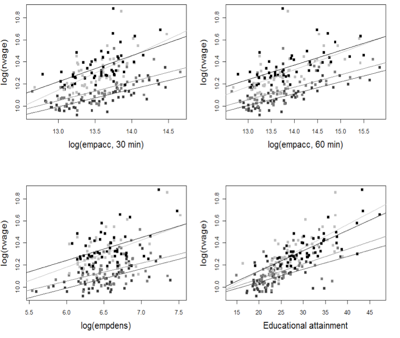 This suggests that knowledge spillover externalities are likely to be a very important Marshallian source of agglomeration economies.